Offer the special person a gift straight from the heart. Add spark to the day with an abundance of enigmatic flowers. 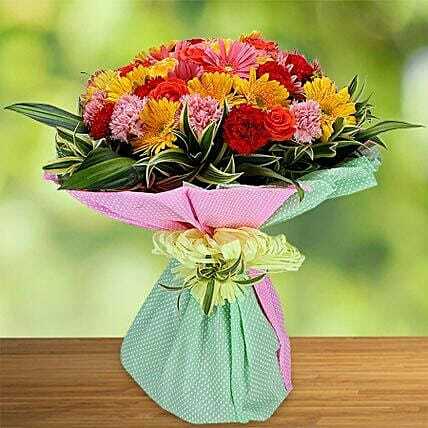 This flower bouquet with a vibrant mix of gerberas, carnations and roses is full of happiness. Convey what words cannot say with this lovely arrangement of flowers. Make the perfect choice and delight your loved ones like never before. ï¿½Flowers always make people better, happier, and more helpful; they are sunshine, food and medicine to the soul.ï¿½ Luther Burbank Meaning of flowers: Gerberas symbolize innocence and purity, chrysanthemums symbolize optimism and joy and orange roses symbolize enthusiasm and passion.